Coming Wednesday: Ohio Day Trips. This unique effort of the Galion Inquirer, Bellville Star, Morrow County Sentinel and Delaware Gazette is a glossy magazine that provides information about possible day trips for families that are less than 60 miles or so from your community. ONTARIO — Altitude Trampoline Park in Ontario has been quite a public success since it opened in November of 2017. Located in the former Circuit City building on West Fourth St in Ontario, the indoor recreation and fitness facility has been a popular attraction for families and people of all ages. Originally planned for a grand opening last August, Contracting issues delayed the remodeling process and pushed the opening date back. But once the doors were opened, business has been steady and growing according to Assistant Manager Katie Clever. Clever, who also works one weekend per month as a member of the Army National Guard, has been a part of Altitude in Ontario from the beginning. “We generally host between 35 to 50 birthday parties per week, with most of those being held on the weekend,” continued Clever. With the next closest trampoline park being nearly an hour away from Mansfield, the draw to come to Altitude covers a large radius and explains the popularity for residents of Richland, Crawford, and surrounding counties. During the daytime on weekdays, Altitude offers Toddler Time from 10 a.m. until 1 p.m. for jumpers ages six and under at a discounted rate. A parent can join their little one in a special sectioned off area of the floor for an additional $2 charge. For older kids, Friday Night Frenzy is held from 7-10 p.m. every Friday evening for ages ten to 13. Jumpers are permitted to jump for three hours and are provided a slice of Gionino’s Pizza and bottled water. Teen Night is held every Saturday for ages fourteen to eighteen at the same price. Sunday Funday is for all ages of jumpers at a discounted rate of $16.95 for three hours of jumping. Altitude in Mansfield also offers fitness classes as do all other locations. Classes are held twice per week on Saturday morning and Wednesday evenings taught my local instructor Lisa McManes. Planning is currently underway to hold an “Autism Jump” in the near future. The first session that was held was a huge success according to Clever. “It was very-well attended. We had approximately 50 jumpers and want to do another session soon,” Clever said. 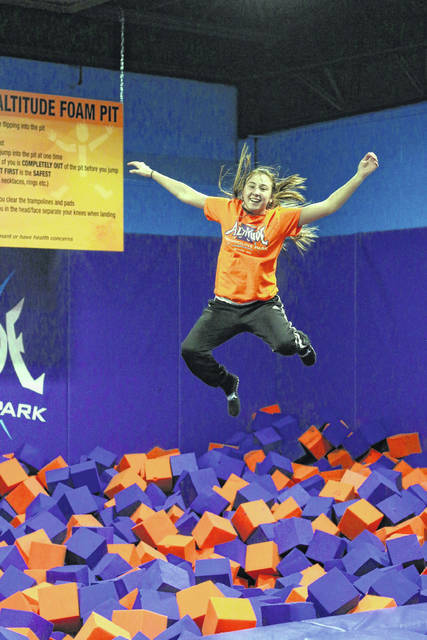 Erin Miller | Galion Inquirer You can go as high as you wish at Altitude Trampoline Park, about 12 miles east of Galion, in Ontario. https://www.galioninquirer.com/wp-content/uploads/sites/38/2018/05/web1_IMG_0050.jpgErin Miller | Galion Inquirer You can go as high as you wish at Altitude Trampoline Park, about 12 miles east of Galion, in Ontario.